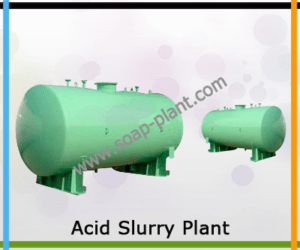 Acid slurry is made by sulphonation of linear alkyl benzene by sulphuric acid. We offer complete inline machineries to manufacture acid slurry. It is all about modernization of technology. We make use of latest software to design all parts and instruments of the plant. We are popular as the largest manufacturer and exporter of the acid slurry plants fully equipped with the easy access systems. We get pleasure from the successful installation and satisfactory running of our acid slurry plants at different global locations. Our plants are adequately running in many countries of different continents like Africa, Asia, Australia and Europe. We expect our business associates in the counties of North America and South America. We offer acid slurry plants with batch type operations and also for continuous operation. Our plants are equipped with all necessary instruments and arrangements for sulphonation. It is easy to assemble and easy to dismantle. It is provided with robust platform and inbuilt steps for the simple and convenient operations. Our acid slurry plants are equipped with all essential safety systems. It is provided with alarms. It is provided with convenient control panel to operate the plant with simple and easy manner. Digital displays are provided for the different production procedure like ageing, separation and dilution.